There's an abundance of perfectly good note-taking software available for organization addicts, with tools like Evernote and OneNote typically topping the list. The field gets even more crowded if you expand to mobile app stores, which are loaded with specialized tools that promise to save all your ideas from those lengthy brainstorming sessions, meetings, or classroom lectures. But don’t overlook Google Drive as a potential go-to note-taker even though it’s generally designed as a word processor. The productivity suite has some key advantages that the note-taking not-quite-competition fail to offer, at least as a singular package. First of all, all of your docs (or notes in this case) are saved in Google Drive, which has the best search capabilities around, hands-down. That makes it easy to find the note your looking for in a flash. Evernote's search is good, but not as good as Google's. You also can use Drive’s excellent collaboration feature to write and share notes with others in real-time—an especially useful scenario if you're doing a group project with colleagues or classmates. Finally, using Docs as your note-taking tool of choice prevents that oh-so-annoying scenario when you're trying to remember exactly where you saved a key file. There's no more "Oh, I put that note in Evernote, but the related Word document is in Dropbox, and the image is in OneDrive," et cetera. If you go all-in with Drive, it's all there. If those sound like capabilities you need, Google Docs could very well scratch your note-taking itch. Transforming Docs into a note-taking powerhouse takes a wee bit of upfront work, however—not much, but some. Here's how to get started. The first step is to create a folder for all your notes—even though Drive’s search capabilities are excellent, it still helps to have some kind of organizational plan for your notes and other files. Create a folder, or several, for all your notes or other items you'd like to keep organized. You could just set up one blanket folder called Notes that you stuff all of these into, or you could get more specific with folders for meeting notes, agendas, recipes, or perhaps even individual classes if you’re a student. Drive also lets you nest folders if you want to further subdivide your organizational system. 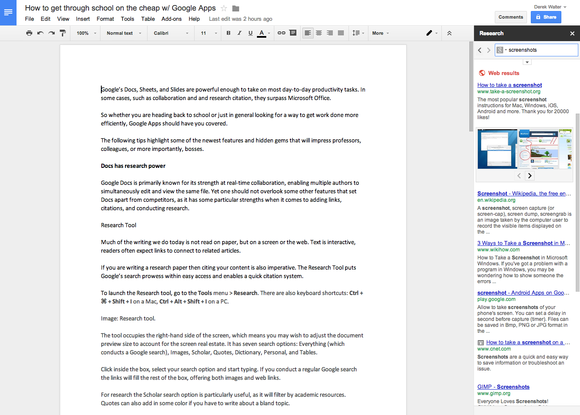 If you’re working on a project with others, you still can’t find a better real-time collaboration app than Google Docs. 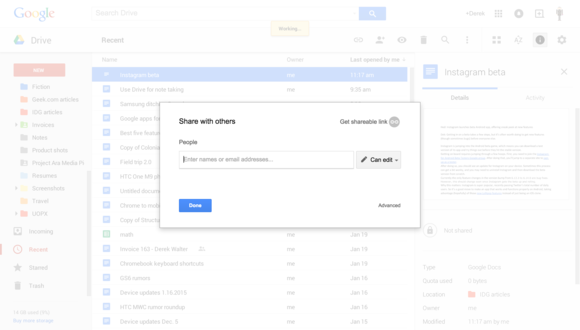 Share a file and edit in real-time with another Google Drive user. Google Drive makes it exceptionally easy to share a page of notes with a colleague—just use big blue Share button in the corner and fire away. Even better, the Docs commenting system allows you to ask questions or discuss any of the material back and forth right inside the file. For some notes you may want more than just the usual blank slate. Fortunately, you can tweak documents to make them function better for notes. Making a table is a good way to organize a page for note-taking. 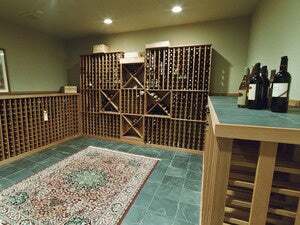 Inserting a table works best. Add a table (Insert > Table) with a couple of rows for a quick and dirty way to split up the page. This works great for a number of use cases, but especially for classroom note-taking or whenever you need to place text next to graphics. There isn't a native capability for splitting your doc up into columns, so a table works best for this kind of situation. You can also add in a horizontal line from the Insert menu if you want to split off one section from another. Google’s search is usually best in class, but sometimes you'll need some additional tools to hone in on what you're trying to find. Drive has several parameters that can refine your search, which is especially useful if the only thing coming to mind is a common term that could be in a large number of files you have saved. Use search parameters to hone in on what you're trying to find. You can specify what type of file you're trying to find—perhaps you want an image you scanned or a doc. If someone else started the file, you can look for one where they're the owner, saving you from too many search results that point you in the wrong direction. Drive also supports powerful search modifiers similar to the ones you can use in the Google Search, which can help you narrow your queries down to incredibly granular levels. Check out the "Advanced Search Options" section of Google Drive's search help page for a full list. It’s easy to add images to Drive; just snap a picture with the Drive iOS or Android app or use your computer's webcam on the desktop. 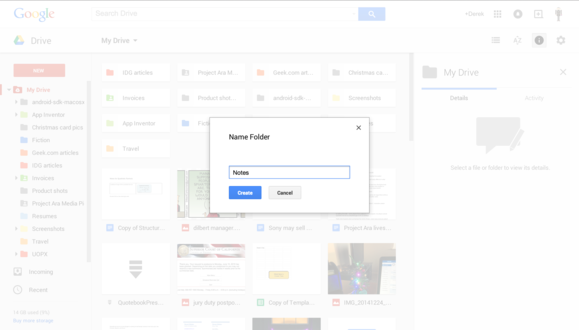 From there you can add the picture to a specific file or anywhere else in your Google Drive. 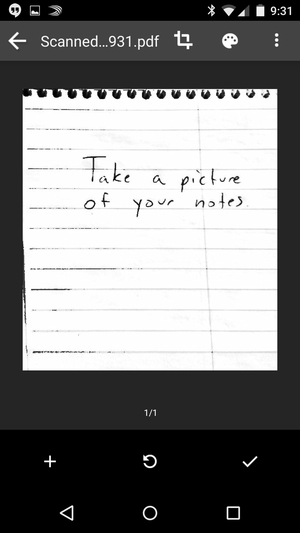 Take a snapshot of your handwritten notes and upload them to Drive. 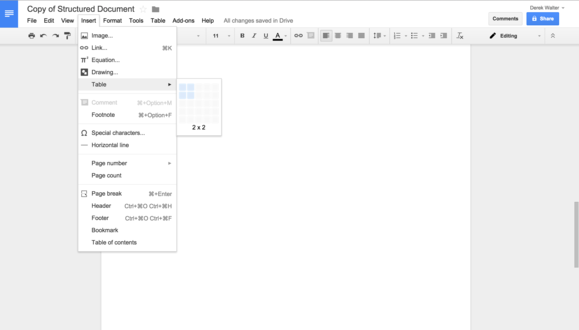 Like Evernote, Google Drive employs optical character recognition to let you search for text inside of the first 100 pages of a text-based PDF, the first 10 pages of an image-based PDF, or JPG, PNG, or GIF images up to 2MB in size. Be sure to orient pictures left-to-right (like you were reading a book) and take photos with as high a resolution as possible to get the best results. The Google Docs Research Tool is excellent for use with articles or research papers—and note-taking, as it turns out. For example, if there’s a phrase you want to know more about, just highlight it and select the research tool. The Research Tool can be an excellent resource for writing in Google Docs. Docs will then pull up relevant links. If you want to keep those links around or if they’re useful for a collaborative note-taking session, then you can make the selected text a link. This can prove especially handy if you have a set of notes that are going to get worked into a report. Docs works well for the use cases we covered here. But it still may not be right for you, depending on your personal note-taking style. For example, if you like to mark up your notes on a tablet with your finger or stylus, Docs isn’t the right choice for you. OneNote and Evernote have more extensive organizational systems if you juggle multiple projects or digitize a ton of paper notes. Evernote and OneNote also allow you to embed audio recordings in notes. Additionally, Surface Pro 3 owners shouldn't forget about the tablet's deep integration with OneNote, which fires up with one click of the digital pen. Both OneNote and Evernote offer some in-depth tricks for note-taking power users, as well—tricks that Google Docs can't match. 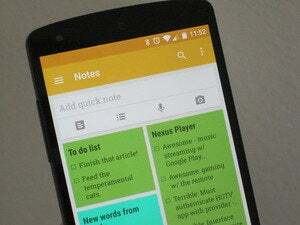 Google Keep is is Google’s take on a quick note-taking tool. It syncs across the web and Android (sorry iOS users) and is generally a great way to save quick notes or check-box lists—its Sticky Note-style layout doesn’t really lend itself to more detailed files, however. Yet you never know if Google will one day announce some bigger plans, perhaps more deeply integrating Keep with the rest of Drive. So watch for how Keep develops over time. 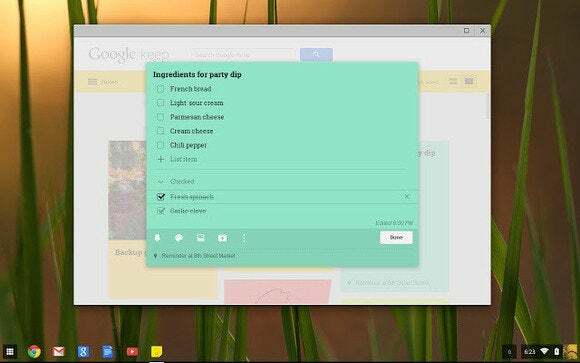 Either way, Google doesn't look to be letting Evernote or Microsoft run away with the productivity prize.